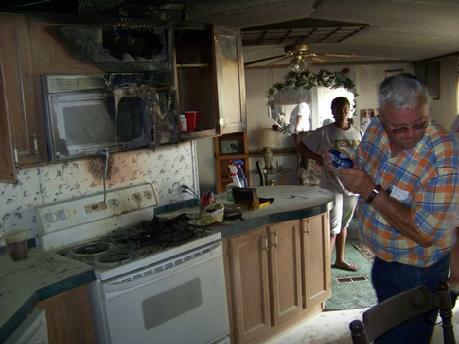 Resident Marilyn Wortham looks on as Fire Chief Corky Cochran inspects the damage. Quick Response From LVFD Saves Home From Certain Destruction, LIVINGSTON, July 13, 2008 - A fire that broke out at a mobile home on 112 Greenfield was quickly extinguished by the Livingston Volunteer Fire Department on Sunday. The fire broke out shortly after 1 pm in the kitchen right at the stove. The mobile home is owned by Byron Lyons of Livingston. Lyons, who lives nearby and was present as the fire was being put out, was renting the mobile home out to Marilyn Wortham who resided in the home with her son. Within minutes of the fire breaking out, the Livingston Fire Department was all over the situation and was able to prevent the fire from totally destroying the mobile home. Livingston Fire Chief Corky Cochran and Pct. 4 Commissioner, Tommy Overstreet were on the scene and accompanied by a host of firefighters and two fire engines. Also at the scene was Livingston Police Officer, Leon Middleton. Resident Marilyn Wortham was visibly shaken up and was trying not to cry when speaking of the incident. Wortham stated to PolkCountyToday.com that she "...didn't know how the fire broke out, and that she had the stove turned off...". The stove and cabinets above the stove sustained heavy fire damage and the once white ceiling of the main living area of the mobile home was blackened from smoke. Wortham stated that she "...was thankful that nobody was hurt and things could've turned out much worse". The scene was cleared up in less than an hour. Good job to Corky Cochran and the Livingston Volunteer Fire Department.